Everyone has a few inside jokes. Something that isn’t funny at all to everyone else is hilarious to you and maybe a childhood friend or two. This is one of mine. Squirrels are funny to my best friend and I. From being warned when we were eating outside that friendly squirrels might be rabid, to leaving messages on answering machines that made one sound like a rabid squirrel, rabid squirrels have been funny to us for over ten years. Interestingly enough, rabid squirrels are pretty uncommon in nature – rodents (and lagomorphs) don’t really get rabies. So they’re not much of a hazard. I have tasty chestnut and almond (and a little rice!) flours on hand lately, and decided to put my squirrel cookie cutter to use to make a gluten(and dairy)-free in-joke cookie. And I thought they needed eyes. And remembered I had recently bought royal icing eyes. 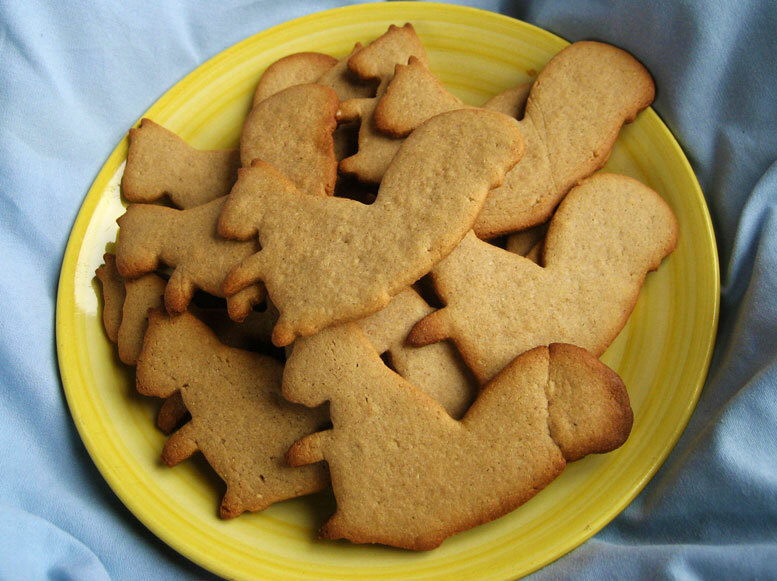 And thus, the Rabid Squirrel Cookies were born. The rabid part is optional, but I’m including it in the recipe. Because I wouldn’t make them without the rabies. Cream the fat with the sugar. Beat in egg and vanilla. Whisk together the flours, baking powder and salt, if using. Combine dry with creamed mixture. Turn out and wrap in plastic. Chill at least 3-4 hours, or overnight. Preheat oven to 375. Roll out between layers of plastic wrap or parchment to 1/8″ thickness. Cut out squirrel shapes and arrange on Silpat(or parchment)-lined baking sheet at least 1″ apart (about7 or 8 to a sheet). Bake for 7-14 minutes, turning halfway through if your oven has any hotspots (if you see some getting browner than others). Cookies will be slightly puffed with light brown edges. Allow to cool at least 5 minutes before removing to cooling racks, and allow the sheet to cool fully before loading up the second batch (you can refrigerate the dough while you wait if it’s getting too soft). Makes 12-16 squirrels (and one little lump of excess dough). Allow the cookies to cool completely. In a small, shallow dish, mix the milk and powdered sugar together with a small whisk. Once it forms a thin paste, use a toothpick to carefully smear a little on the backs of the eyes. Place on squirrels and allow to dry. These cookies are kind of sandy, naturally sweet from the chestnut flour and earthy from the brown sugar. They would be excellent with tea or maybe coffee. And because of their roll cookie nature they are sturdy and will keep for up to a couple months if well-wrapped. These are way toooooo cute! I especially loved how the cookie squirrel was so kind enough as to pose with all those mixed nuts. What an appetite that little guy has! The eyes are the best. LOL. Makes me want to eat one, or two, or three . . .
Secret ingredient=rabies Roger that! Those eyes are awesome, and I think I’d like to be part of your group that thinks rabid squirrels are hilarious! hilarious. I love the idea of combining almond meal and chestnut flour. Very nutty. HA! Get it?